Dog-gone cute is my first thought when looking at the unbelievable details of this boy’s birthday puppy “paw-ty” theme designed by Kelly Lyden, of WH Hostess, for the two-year old son of one of her clients. Staying true to her company’s classic style, Kelly created a brand new custom party collection in a fun, preppy color way of brown, red and turquoise. I adore the creativity behind the custom patterns used throughout the printable decorations and invitation. A basket weave pattern made out of dog bones (so clever!) paired with chevron and puppy silhouettes made for an incredible combination. Accents of red and white ribbon and an adorable spotted dog topped off the design work. I am in love with the photos by Only Once Images. Be sure to “paws” and check out the colorful details of this Creative Boy’s Puppy Themed Birthday. Don’t miss out on this Dog-Gone Cute Boy’s Puppy Party. Marking the party territory from the outside is always a festive way to greet guests. Two large balloons with a “Cameron’s Dog House” sign and a jumbo stuffed dog dressed up in his party hat made a paws-itively adorable entrance. Once inside, the puppy décor continued. A long table was set up in the family room which was dressed with a red tablecloth and custom table runner in the bone basket weave fabric and embellished with blue pom pom trim. Stuffed puppies decked out in party hats sat at each end of the table. The table was styled using two different centerpieces that alternated down the center of the table: a grass plant holding printable centerpiece sticks, and a silver bucket of red and white striped balls. Jumbo balloons soared above the table, adding height to the décor. Darling details were at every turn. Puppy chair plaques were tied to the backs of the mini white Chiavari chairs. Party hats dressed up with printable stickers sat at each place setting. Amazingly cute dog-bone shaped sippy cups were wrapped in printable patterned labels. Bottled water decked out in custom labels were served to adults and kids. The food buffet was set up in the dining room. Using an oversized cling of the spotted puppy graphic, the room was accessorized in such a cute way. The puppy held up a banner which read, “Bone Appetite”. Clever! White urns flanked the table, with red carnation pomanders that resembled red balls. The printable napkin wraps dressed up the utensils and everything was housed in large silver dog bowls. Guests would appreciate that each item on the buffet table was identified by a coordinating food tent card. Thirsty guests could find a variety of beverages at “Cameron’s Water Bowl”, a bar set up on the kitchen island, framed by a colorful pennant banner and matching doghouse sign. Drink dispensers full of sweet tea and lemonade were labeled with printable dog bone tags, and paper cups were dressed up with printable puppy stickers. Outdoors, the seating area was dressed with throw pillows made in coordinating custom fabric. The fireplace mantel was strung with a red ball garland. A tray of “fetch” sticks (licorice) sat on the coffee table for guests to nibble on. I love the fun theme appropriate activities planned for guests: red balls and Frisbees, dressed up with custom labels, set nearby with a sign that said “play fetch”. A bounce house and face painter kept the kids busy and while they waited their turn, they could “pose with the pups”. Kelly designed life-size dog silhouettes in coordinating party colors that were printed on foam-core. Ribbons served as leashes and the kids could pose with them, as if they were walking the dogs. What an incredibly unique twist on a photo booth and printable designs! Everyone was invited to “shop” at Cameron’s “Barkery”, the dessert table! The table was dressed in a brown tablecloth and a custom fabric backdrop framed the table. I absolutely adore the way the dessert table was styled to mimic a bakery counter! Each treat had a printable tag on it with the “price”. All white cake stands were used to highlight the sweets; they were embellished with brown and white ribbon and coordinating cake plate clings. Treats included puppy cupcakes, chocolate macarons, tennis ball cake pops, sugar cookies in the shape of the spotted dog and a bone, polka-dot, chocolate-covered Oreos and whoopie pies. Candy jars added a pop of color to the table, and a menu sign informed guests of their options. Fun spotted doggie bags carried a “thank you for visiting Cameron’s Barkery” sticker. Of course guests were encouraged to fill them up with treats to take home. Check out the life-size puppy cake from Cakes by Gina! Amazing in every way, it sat on its very own table, flanked by oversized balloons. If you aren’t already astonished over the incredible details of this puppy birthday party, take a peek at the take-home party favors! At the end of the event, little guests were invited to visit “Cameron’s Puppy Shoppe” and adopt a stuffed puppy of their very own. The favor table was lined with artificial grass and a fabric backdrop made to coordinate with the printable décor; notice the darling puppy silhouette pattern on the fabric! Wooden crates provided temporary homes for stuffed puppies until new little owners could officially adopt them. Each child was given their very own adoption certificate and “doggie bag”. 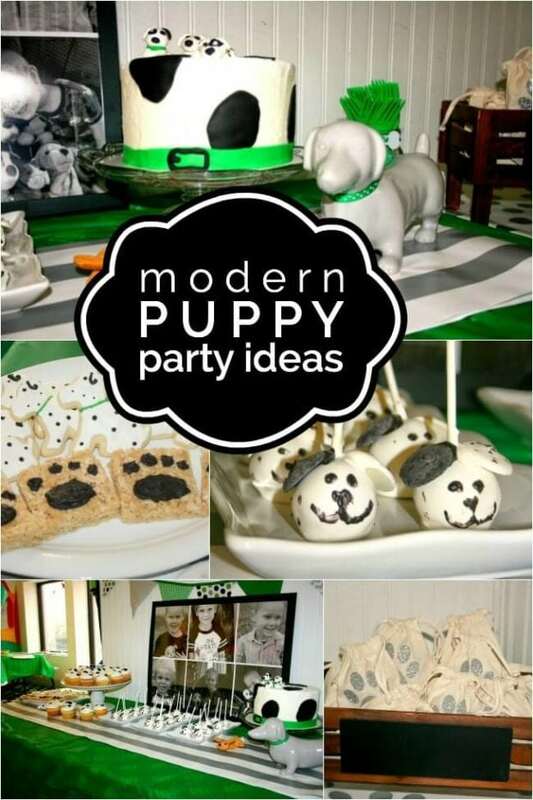 This party is filled with great details perfect for any puppy party!